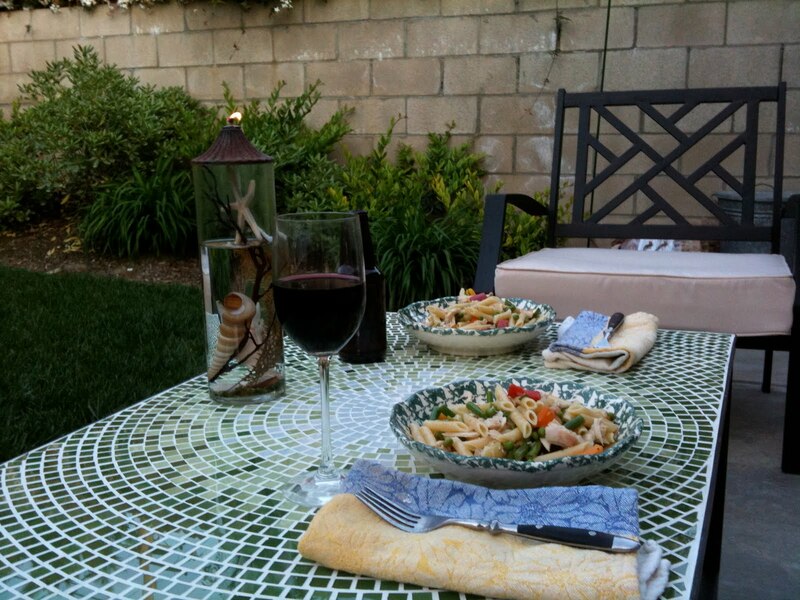 It was totally amazing super warm weather this weekend, so I thought a cool Pasta Salad dinner would be easy and appropriate for outdoor dinning. We are just starting to deal with our backyard, in regards to setting up a space to kick it. We finally got some outdoor furniture !! Love it. I was winging it when I made this, so I’ll do my best to relay the recipe as best as I can. 1/2 lb pasta, your choice. 1/2 cup each of chopped gold, red and orange bell peppers. 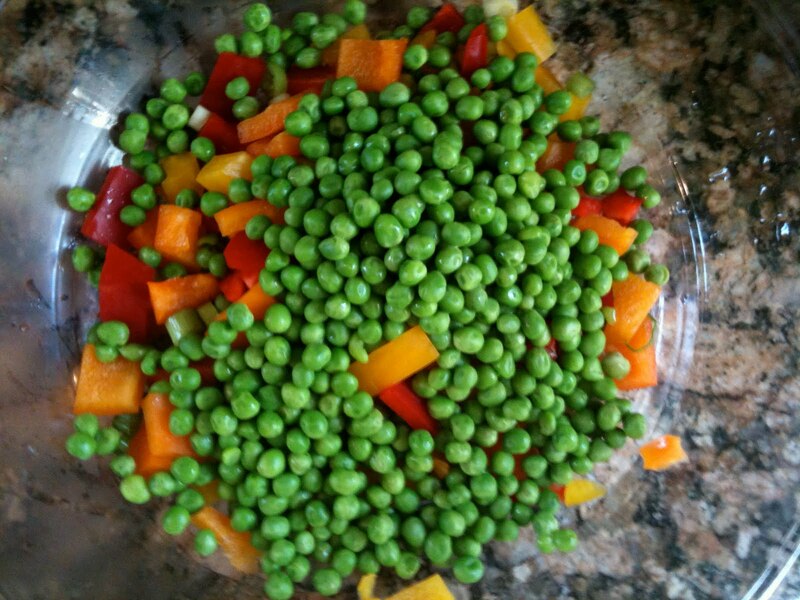 1 cup blanched petite peas-rock fresh peas if you’ve got them, if not use frozen-never use canned peas-ever. Preheat oven to 400. 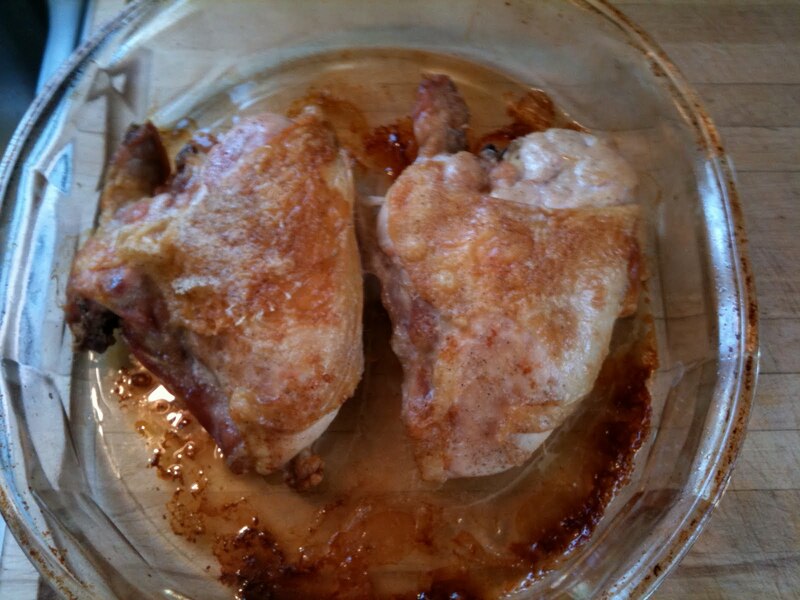 Rinse and dry your chicken breasts, drizzle with olive oil and season well with salt and pepper. Bake in an oven safe dish for about 20-30 minutes depending on the size of your breasts. 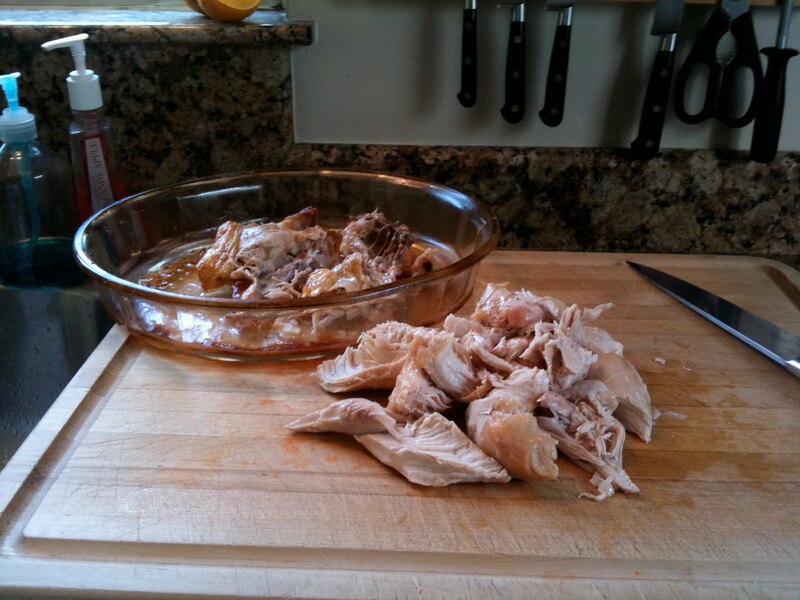 Skin should be browned and juices will run clear from the cooked chicken. Set aside to cool for deboning. Get your pasta water boiling in a large pot and add enough salt to the water so it taste like the ocean. In a smaller pot, but not tiny, boil more water for blanching, salt this one normally, not like ocean. While the waters are boiling, get to chopping the bells, green onions and shallots. When the smaller pot has a good rolling boil, add the frozen peas for 4-5 minutes only, strain out with a slotted spoon and set aside. I should have a picture here for you but I don’t, sorry. When you get all the peas out, then add the green beans – you may want to trim them, it’s your call – boil- blanch these for 5-6 minutes, strain these and set aside. Add your pasta to the salted ocean like water and cook as long as package says to al dente. All these steps can be done on your own time frame.No rush, it all hangs out to wait for the final mix up. I let the veggies cool to room temp, then I’ll add them to a big mixing bowl with the bells and onions, while I get the chicken deboned. Add the chicken meat, torn into bite size pieces to the mixing bowl with the raw and blanched veggies. Whisk the oil, vinegar, lemon and shallot together. Vinaigrettes are a very personal thing to me. Make them to your taste. It all depends on the available ingredients. If I have Meyer Lemons, they lead the charge for flavor. You may have a super amazing olive oil that you love. Make it taste the way you like it. 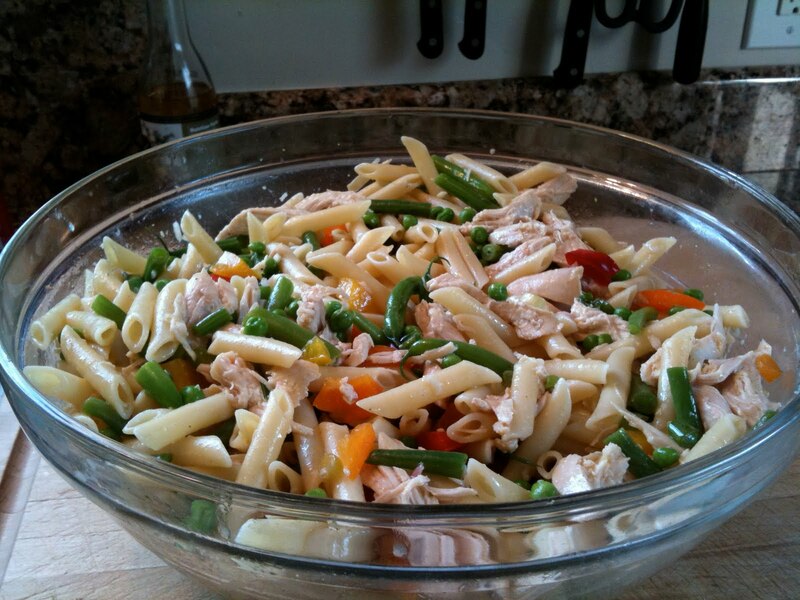 Keep in mind pasta salad absorbs a lot of dressing, so don’t be shy with it. Salt and pepper it as you go until it hits the spot for you. I’m way into white pepper and mineral salts right now, they rule !! Try them. Pour dressing over the entire mixture, mix really well and let sit for a while before serving. Super yummy cool meal for warm weather ! ENJOY. This entry was posted in Spring by Sarah. Bookmark the permalink.